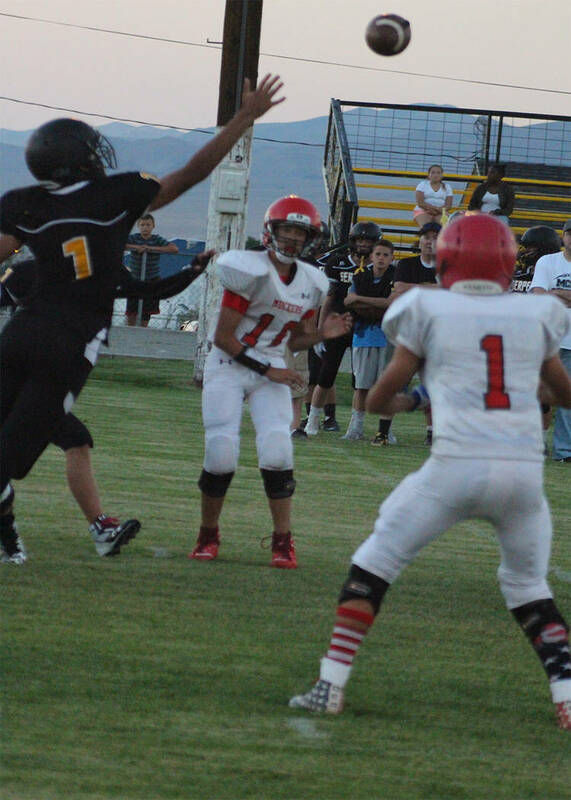 The Tonopah High School football team lost its season opener 82-56 to Mineral County. Penny Otteson/Special to the Times-Bonanza & Goldfield News John Shiflet finds some open ground against Mineral County on Friday. Shiflet had 233 yards, which was nearly half of the total offense. Penny Otteson/Special to the Times-Bonanza & Goldfield News Dillan Otteson completes a pass to John Shiflet in last weeks road game to Mineral County. The Muckers fell to the Serpents 82-56. Sophomore Muckers quarterback Dillan Otteson had 20 completions for 349 yards and ran for 73 yards in the Friday road game at Hawthorne. Three Tonopah running backs also chipped in, junior John Shiflet, sophomore Damian Pace, and junior Brandon Scobee, who combined for 157 yards. “It’s a work in progress,” Muckers head football coach Duffy Otteson said, speaking of his young, inexperienced team, which put up nearly 832 all-purpose yards in a losing effort. The Muckers defense gave up 82 points. “We are a very young team with only one senior and a lot of sophomores and freshmen, and we need to spend more time on our defensive game,” the coach said. Junior running back Shiflet scored three touchdowns, two receiving and one rushing for a total of 233 yards for the offense. Junior tight end Kevin Pope had two touchdowns with nine receptions for 92 yards. And finally, sophomore Vance Day had one TD and 103 yards and sophomore Scobee had one TD and 59 yards. On defense, Day led the team with 13 tackles and a half sack, followed by Shiflet with 12 tackles and a fumble recovery. Pope had 11 tackles and one and a half sacks. Mineral County coach Les Horn said one of his running backs had 225-yards rushing and his QB had 196 yards. 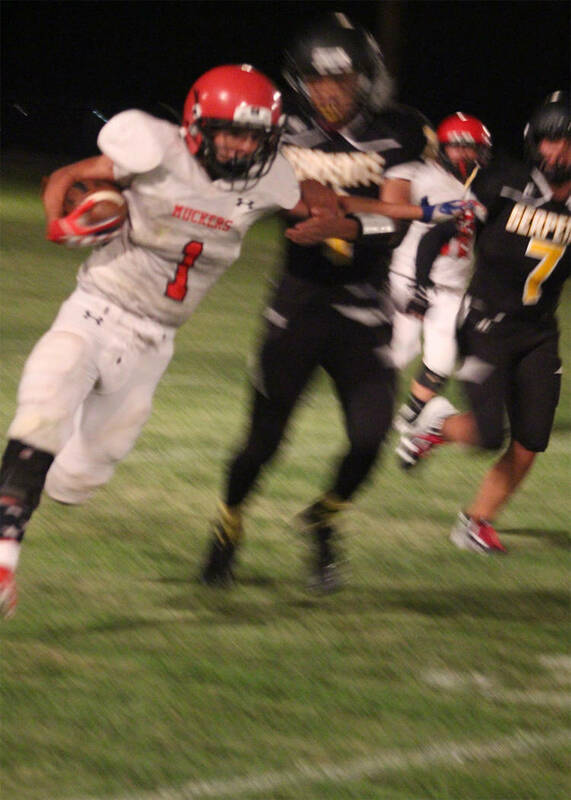 The Muckers’ home opener is on Friday as they face the always tough Independence, California.